You can eat your apricots fresh or dried out. Now, the question is, which of these options is better? Fresh apricots are excellent sources of fiber, potassium and other antioxidants. They are good for the skin and help muscle function. They help regulate heartbeat and help maintain healthy blood glucose levels. The dried variety has water removed from the fruit. Drying apricots do not affect their nutritional value. They offer the same benefits as fresh ones. You can have them as snacks, used as confectionery or a compote. So, if you’re interested to try drying your own apricots, there are several ways to do so. You can sun-dry them, use an oven, a microwave oven or even a dehydrator. Read on to find out more about each method of drying apricots. Before you start drying, you need to first buy or pick the apricots that you’re going to use. Make sure that the ones you chose are fully ripe. You can tell this by their golden color, and delicate texture. They are usually soft and not too firm to the touch. There are several ways to dry your apricots. The most popular is sun drying as it is a natural method. It also keeps the flavor and nutrients in the dried fruit. First, you need to prepare a drying tray. You can make your own drying tray using a piece of chicken wire, wood, some nails, and hammer. Build a simple frame and place it on the sunniest and windiest position outside your home. You can also use cooling racks as an alternative. Set them on top of cookie sheets and place them on your drying area. It’s important that the rack lets air flow around the fruit. Once your drying rack is ready, choose your best selection of apricots. Then, cut them in half, take out the pits and cut them again into quarters. Place the cut apricots with their inside out on your drying tray. Let them dry for about three days to a week. Another option is to first dip the whole ripe fruit in a salt solution. Add two tablespoons of kosher salt in a gallon of water and then stir. Then, dip the ripe fruit in. Split it with your fingers and take out the pit. Turn the fruits slightly inside out and place them onto your drying tray. Instead of a salt solution, you can also use a lemon juice and water mixture to dip your apricots in. Doing this will help prevent the apricots from browning. Also, have a cheesecloth ready to cover the fruit with to keep bugs out. Pros: It is an all-natural method of drying fruit. It’s simple and can easily be done. Cons: It takes several days to dry fruit. Weather is uncontrollable and is risky when drying outside. Spray some lemon juice on the apricots before placing them on the dehydrator – lemon juice keeps the apricots from browning. Apricots can be dried whole, but dehydrating will be more effective if they’re halved and stoned. Start off by washing the fruit and patting it dry with a clean towel or a kitchen roll. Then, place the fruits in a single layer on the drying tray. Make sure to keep the cut side up so that the juice doesn’t run out. Start the drying process by setting the oven to low heat at 50 degrees Celsius. Watch the fruits carefully. Once the skins start to shrivel, increase the oven temperature to 65 degrees Celsius. Keep at it to complete the drying process. Keep the oven door slightly open to allow moisture to pass through effectively. Once done, remove the trays from the oven and leave them to cool at room temperature for about 12 hours. Then, you can pack the dried apricots in airtight jars or cardboard boxes. Pros: This process has a faster drying time. Cons: It requires keen supervision to avoid mishaps while drying. Start off by washing the apricots, patting them dry, removing their pits and cut them in halves. 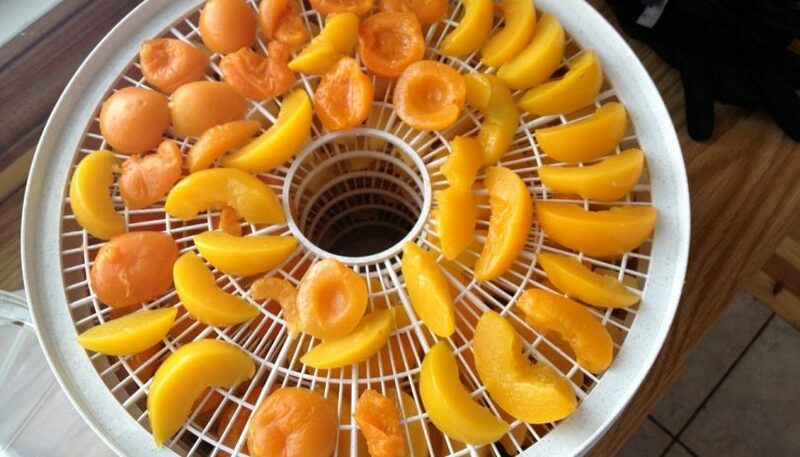 Place the apricots onto the dehydrator’s racks with the flesh facing up. Try not to pack the halves too close. Ensure that there’s enough space between each piece for proper airflow. Check the dehydrator’s manual for the temperature and time needed to dry apricots. Normally though, dehydrators are set at 57 degrees Celsius and take 12 hours to dry apricots. Pros: This process has a faster drying time than sun-drying. Cons: High risk of over drying the apricots if not monitored properly. Drying time varies. NB! Spray some lemon juice on the apricots before placing them on the dehydrator or in the oven – lemon juice keeps the apricots from browning. To use the microwave oven for drying, first, you need to cut the fruit into thin slices. Make sure that they’re not too thin or they may stick to the microwave surface. Then, ensure that the microwave plate is thoroughly washed and dried. Place the apricot slices into the plate and make sure to leave enough space between slices. Choose the defrost setting and set the timer for 30 minutes. Check back after 30 minutes and flip the fruit. Check if it has finished drying. If it’s not and the fruit is still moist, flip the fruit and set the timer for another 5 to 10 minutes. Apricots are juicy fruits and may need about 45 minutes in the microwave. Pros: It is the fastest drying method. Cons: Microwaves can only process small amounts of fruit at a time. Once the apricots are dried, they should be cooled at room temperature. Then, you can either pack them in moisture proof polyethylene bags or store them in glass jars with lids. Make sure that dried apricots are stored in the refrigerator. Exposing them to high temperature will make the fruit hard and dark in color. The fruit may also lose its nutritional value. If kept well inside a refrigerator, the apricots can last for about 6 months. Keeping it at room temperature shortens their life span to only a month. Apricots are not only delicious but healthy as well. Whether you take it fresh or dried, an apricot produces the same nutritional value for you. The advantages of drying apricots are that it’s easy to do and easier to store. Dried apricots have amazing health benefits that you should be taking advantage of. So, why not start and make some dried apricots today?